Marseille players became involved with fans prior to their match in the Europa League with Portugal’s Vitoria Guimaraes. 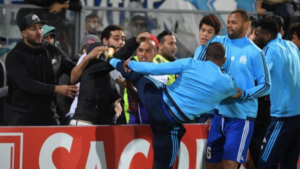 A disciplinary proceeding was started by UEFA against Marseille’s defender Patrice Evra after he kicked toward the head of one of the club’s supporters. Evra, who was a substitute for the fixture in Portugal, lashed out during a heated confrontation prior to the start of Thursday’s match. The former defender with Manchester United was sent off before the match started and on Friday UEFA released an announcement that the veteran, who is 36, would miss a minimum of one match. The disciplinary body for the organization will discuss Evra’s case on November 10, at its next scheduled meeting. It is almost certain the player will face a far more severe ban from the UEFA following scenes that brought back memories of the kung-Fu kick of Eric Cantona in 1995 at Selhurst Park. Video of Thursday’s incident showed Evra kicking at one of the fans from Marseille as the club’s supporters and players confronted one another off to one side of the pitch. A teammate quickly ushered Evra away following the kicking incident. Rudi Garcia the manager of Marseille said following the incident that Evra reacted to taunts from fans, but criticized his defenders actions. Garcia said that Patrice is experienced and must not react to the insults from one of the club’s supporters. About the Marseille fan, Garcia only would say he was not a fan of Marseille because you do not insult your own players, as you must be supportive of all players. Evra, a former captain of France’s national team, who won five titles in the English Premier League and a Champions League title during his spell of eight years with United, signed with Marseille in January after playing for Juventus, but has only appeared twice for the French club across all competitions thus far this season. The club announced that it too had started its own investigation into Thursday’s incident. The club, which plays in topflight Ligue 1 in France, said that professional footballers must keep their self-control despite insults and provocations, regardless of how unjustified they might be. However, the club added that it only condemns the destructive behavior of what it called pseudo-supporters that hurt our own players when they should rather be supporting the club.